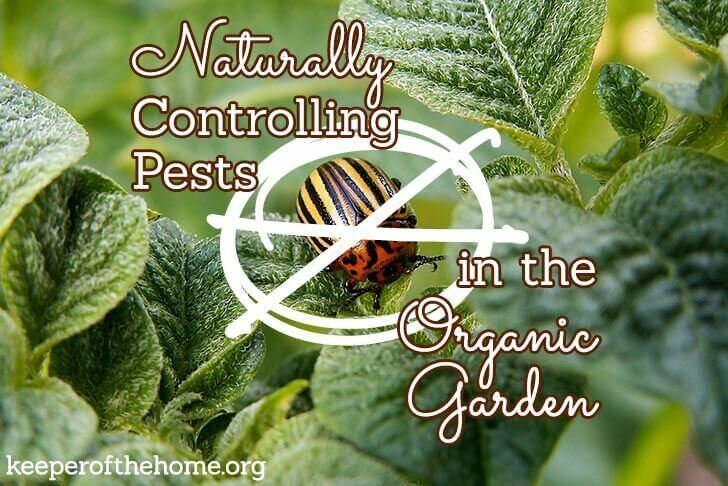 Pests are something that organic gardeners have to deal with. However, there are ways to deal naturally with pests so that you are still able to limit your exposure to chemicals that are not good for you or your family. We have a huge garden that provides the majority of the produce that we eat throughout the year. Since, we depend on the garden as the main food source for our family, it is very important that we try to protect it from pests that would otherwise eat our food. When I first began gardening, this was intimidating to me. However, as I realized that either my family got the produce, or else the bugs did, I quickly became less “scared” of bugs. First, you want to have an idea about which bugs you want to leave alone because they are natural predators that eat other bugs, and which bugs you want to remove or kill because they are eating your plants. There are many beneficial bugs, but some of the most easily recognizable are lady bugs and praying mantises. To manually remove bugs, we go around with a cup of water and knock the bugs, larvae and eggs off into your cup of water. We then feed these bugs to our chickens, ducks and guineas. If you do not have birds to feed the eggs and bugs to, make sure that you remove the cup from the garden and have them stay in the water until they drown, so they don’t escape and go back into your garden. If you are not feeding them to the birds, you can add a few squirts of dish liquid to the water to ensure help the bugs stay in the water. You can also simply kill the bugs on the leaves. There are a couple of reasons that this can be beneficial. Some bugs do not like to smell other bugs of their kind that have died, and might avoid the area where the bugs have been squished. Also, this can be a lot quicker than knocking them off. You will want to know what type of bug you are squishing first, since some of them can bite or sting. However, the majority of bugs that we encounter in the garden, are harmless to us, and just enjoy eating the plant. Note: Lady bugs are beneficial to a garden. However, they look very similar to Mexican Bean beetles and other types of beetles. The easy way for me to tell that it is a lady bug is just to look at their head. If the head is black and the body is red or orange with spots it is a lady bug. If the entire body is red or orange, without a black head, you will want to kill it. Mexican bean beetles are very resistant to many methods of bug control, however, manually removing them, or the homemade bug spray I will mention below are very effective on these. Another method of controlling bugs is to purchase bugs that prey on the bugs you want to get rid of. This is a very natural method of controlling bugs. 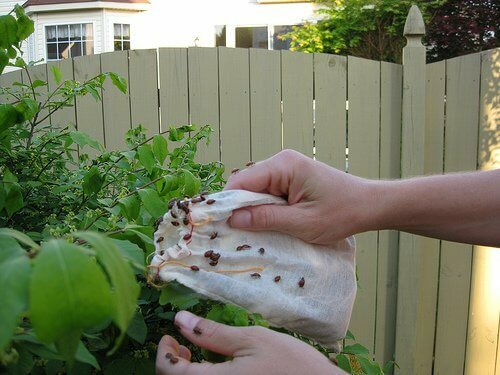 However, you need to decide how you are going to control the bugs in your garden before using this method. If you are planning on using an organic pesticide, these will kill ALL bugs, not only the bad bugs. You do not want to waste your money buying good bugs, only to turn around and kill them when you use organic pesticides. We order our bugs from Gardens Alive. We buy the bugs that are specific predators of the bugs that we have the most problems with. Of course once you purchase these bugs and introduce them to your garden, there is no guarantee that they will stay. However, we usually have enough bugs to where ours want to stay around and feast since our garden is so large. Manually taking time to remove bugs, is really only practical for us in the early gardening season when the plants are small. Our garden is way too large to have time to manually remove all of the bugs. 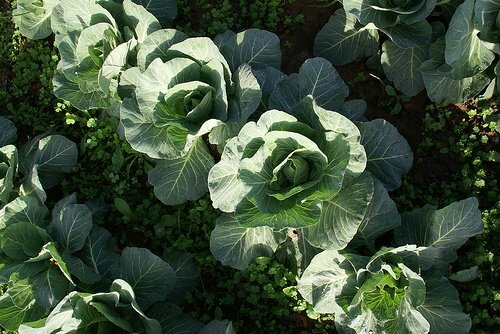 While we still kill them as we come across them when picking, we have to use a natural bug spray to help control them. This spray is basically a type of pepper spray, so you will need to use common sense when using it. We wear protective eye gear, masks, gloves, and long sleeves when spraying. Also, we do not spray when it is windy or about to rain. This is not a poisonous spray, so it will wash off of leaves after a rain, and will need to be reapplied. Since you are spraying a pepper spray, you also don’t want to spray right before you pick your produce so that your produce is not spicy. Make sure that you spray the underside and tops of the leaves. Most bugs stay on the underside of leaves and lay their eggs on the underside. This natural bug spray works because it is spicy. It is made up of mint, red hot peppers and garlic. The bugs don’t want to eat the leaves that have this spray on them. Also, when they rub up against the spray, it can kill them. We use ingredients from our garden to make the spray. As a result, I don’t have exact measurements for how much of each we use. That varies throughout the summer based on how much our plants are producing. Cut up and mash the garlic you are using. Place the garlic, mint and hot red peppers into a pan of water and heat almost to a boil. Remove the liquid from the heat and allow it to sit overnight. In the morning, strain the liquid. Add a couple of squirts of dish liquid per gallon. That is all you need. Then you can spray your plants. We use gallon sprayers that many people would use to spray fertilizer or pesticides. Remember the common sense cautions when using this spray. Neem is an organic pesticide that can be used on your plants. The downside of Neem is that it will kill ALL bugs, not just the bad ones. Also, it will kill your honey bees. To try to protect the bees in your garden, make sure that you do not spray the blooms. This will provide some protection. If you are interested in Neem, you can read more about it, and purchase some here. Slugs can cause much damage to crops without you ever seeing them. Most gardens have slugs. If you have seen damage to your plants and no bugs around then slugs are probably the culprit. Honestly, even if you do see bugs on your plants, you probably still have slugs feeding on your plants. Slugs come out at night to eat, so typically you will not see them unless you go out at night with a flashlight and look. You can check out my post here for tips about how to naturally control slugs. How do you control pests in your garden? This post is really great! I’m saving it so that I can refer to it next year when we hopefully have a garden. Hey – you used my picture of lady bugs! I feel famous! And they did a fantastic job, although they didn’t all stick around. We enjoyed seeing the lady bug larvae, too. They stick around and eat up the aphids just like the adults. My kids were amazed to see all the little lady bugs streaming out of that tiny bag. It was a lot of fun to release them. @Sarah, So fun- I had no idea who’s picture it was! It looks like a lot of fun, and I’m glad to hear that it was successful for you! I don’t have a garden this year (apartment living do to a house fire) =( but in the past we have grown “bug-boarders” around our garden- melissa mint, lemon verbena, basil, lavender, marigolds, purple cone flowers. These are all plants that discourage different types of bugs… ants & slugs hate mint, flies and those little black & gold beetles hate marigolds, lavender & lemon verbena attract beneficials and keep away mosquitoes which don’t do much damage to a garden but can wreak havoc on the gardener. Purple cone flowers attract butterflies & bees, which keep away aphids & moths (moths & their larvae will do a lot more damage than butterflies) plus… pollinators! In the past we have used diatomaceous earth to control tomato worms. We went from totally devasted tomato plants one year to finding about three worms the next when we applied the d. earth. Did you till it in the ground or sprinkle it on top? Did you apply it before planting or after? How many times during the growing season? I’m assuming you used food grade DE, right? @Darcy, I’ve always been a little scared to use that stuff, I’ve heard you have to be very careful with how you apply it… what did you do? The link on neem oil says that it will NOT kill beneficial insects, earthworms and nematodes. Does the neem spray you use have other ingredients that would be harmful? Hi Rene! How do you control ants? They have been the major source of devastation in our garden this year. We live in a residential neighborhood governed by an HOA and I have to keep my garden small, in the backyard, and in a raised bed. I believe the railroad ties we bought may have come infested with the critters, but they have destroyed everything! I have tried lots of home remedies I found, and water with dish soap. I am pregnant as well so I have been trying to avoid even organic pesticides (granted, I could get my husband to do it). One of my zucchini plants fell right OFF of its stalk the other day when I touched it; ants had chewed through the stem! I’ve pulled up most of my plants already. Only the tomatoes and chili peppers seem to be doing well (I have them surrounded by herbs). Any help would be great! *Note* we are replacing the ties with 2×6’s, just in case. This was an excellent post. Very informative and although I’ve been organic gardening for a few years now I learned somethings new. Thank you! great post! At our house its the earwigs. So far nothing I have done works well enough to mention (trapping, spraying with dish soap). The only good thing is that I have learned that plants sometimes fight back anyways…I’ve had carrots with their tops eaten off that grow back!!! And other plants come back too. Not all, but hey at least its not all a loss. My issues have been aphids and fungus gnats. The aphids are gone for the season, but I will be ready for them next time! I am currently fighting some fungus gnats on some potted azaleas. I’ve put a bowl of apple cider vinegar next to the pot, and I put the pot in direct sun so that it will dry the soil. I am going to put some diatomaceous earth on the top of the soil to prevent the larvae from hatching/living very long. I am just starting to learn about natural gardening options, this is a perfect start! I have banned using chemicals inside my home, my dream is to have a garden and I will not use any chemicals there also.